I'm a huge fan of turn based strategy games, but Age of Wonders 3 is rubbing me the wrong way. Don't get me wrong - Age of Wonders 3 is a really good game. It's got a lot of good things going for it. The strategic map is interesting, with cities, outposts, treasure sites, and a bunch of different ways to approach colonizing and conquering it. Armies move over the board like chess pieces, and they're not the overpowered unlimited stacks of some games, but they're not the vulnerable single-unit-per-tile, micromanagement-heavy units of games like Civilization 5 and Beyond Earth. Civilization players will feel right at home, although there is quite a bit of simplification in Age of Wonders 3. City size comes into play, as does certain strategic resource tiles. However, the city management is fairly straightforward and streamlined. I don't really mind; there's a lot of complexity in Civilization 5 that would just bog down turns in Age of Wonders 3. The Civilization series is an easy comparison, but really this is a game in the mold of Heroes of Might and Magic or King's Bounty. The strategic map is really just there to give you a chance to build armies, and the army vs army combat is really the meat of the game. 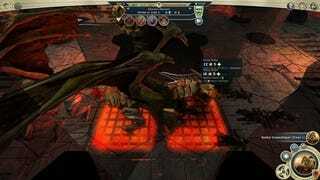 Age of Wonders 3 executes tactical combat very well. Each race and leader class can build different units from a pool of different archetypes. The units generally feel well-balanced and their roles are easy to understand. So Age of Wonders 3 is a really good game. Why can't I seem to like it? I think the problem is two fold. One is that the game really throws you into the deep end. The recommended "new players start here!" campaign is hard. Almost every level starts you out as the underdog, with your enemies possessing extensive armies and advanced cities. They're allied against you and consistently start out at war with you. There's no time for strategy or building yourself up. You've got to blitz early and blitz often. I collected what I learned from playing in order to help new players, feel free to learn from my mistakes. There's a lot of cheesy mechanics in the strategic map as well. In order to win, you've got to take your enemies' throne city and kill their leader. If you just kill their leader, they'll respawn back at their throne city after a few turns. The thing is, it's really easy to just walk right past all the border cities and make a bee-line directly to the enemy's throne city. This assumes you know where it is. You might get lucky and kill their leader along the way, but there's no guarantee. Their leader may be hiding, vulnerable but able to keep the game going far longer than it seems like it should. This bites both ways, too. You've got to maintain an army at every city you own to prevent against sneak attacks, which is costly and time consuming. Even if you know where their army is at any given time, there's no knowing what they plan to hit on their turn. The end result is a game that feels more like a blitz-heavy guerilla warfare simulation rather than a slow-paced turn based strategy game. Winning feels like a combination of cheesy tactics and luck rather than careful planning.